When it comes to your backyard, one of the biggest decisions you will ever make is whether to put in a pool. There are many factors to take into consideration for swimming pool planning – like the cost, the various options on the market and the ongoing maintenance – so here is a guide to getting this big decision just right. Above ground or in ground pool? From the simplest above-ground options to the most expensive in-ground pools, this is an investment that could cost you just hundreds, right up to tens of thousands of dollars. Above-ground pools are the cheapest and easiest to install, but that doesn’t mean they have to look cheap. It will be possible to add decking and lighting and then let your landscaping imagination run wild. In-ground pools are more expensive, being built into the ground rather than installed above it. They have the advantage of avoiding steps and easily blend into your landscaping. Including frameless glass pool fencing for in-ground pools creates an attractive addition to your garden and adds genuine value to your home. It’s important for your pool to blend in with your garden, so think about the pool surrounds and include it in your budget. You might opt for decking, paving or a mix of the two. The size of your pool and the space around it is a factor. A big pool, patio and decking is actually preferred by many people over a large lawn area, as they may be more prepared to look after a pool area that will be truly enjoyed in the summer months than fuss around all through the year with grass and plants. Depending on the size, chemicals to keep the water clean will cost up to $100 every month, whether you’ve put in an above-ground or in-ground pool. If you’d rather just enjoy your pool and leave the maintenance to someone else, contact a local pool cleaner to keep things in shape. The pool itself will need occasional maintenance. An above-ground vinyl liner will need replacing every 5-7 years. In-ground concrete pools will need resurfaced every 9-13 years depending on the finish. Choice (the leading consumer advocacy group in Australia) have written a comprehensive guide to pool maintenance. 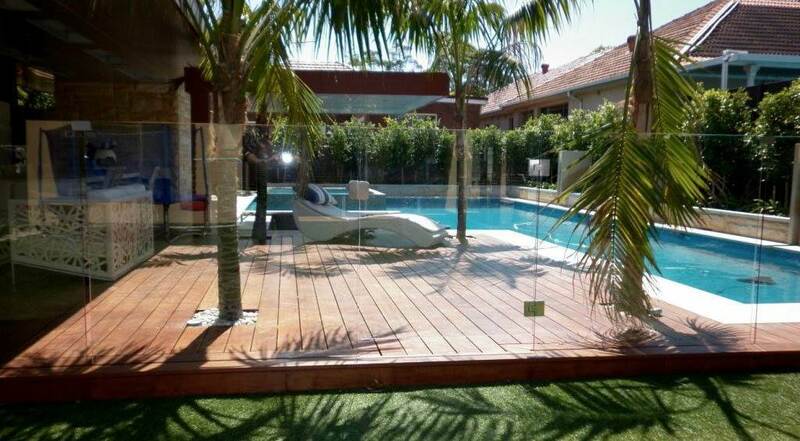 Double-check what your particular local council allows, especially when it comes to pool fencing safety regulations. Some insurance companies may charge you more once you add a pool to your garden, so it’s best to contact your insurance provider to check. If you can think of anything we haven’t when it comes to bringing your outdoor paradise to life with a pool, make sure you let us know in the comments.